Hello there! My name is Joe Inga. I am a 34 year old self taught freelance artist and illustrator as well as a FDNY firefighter. 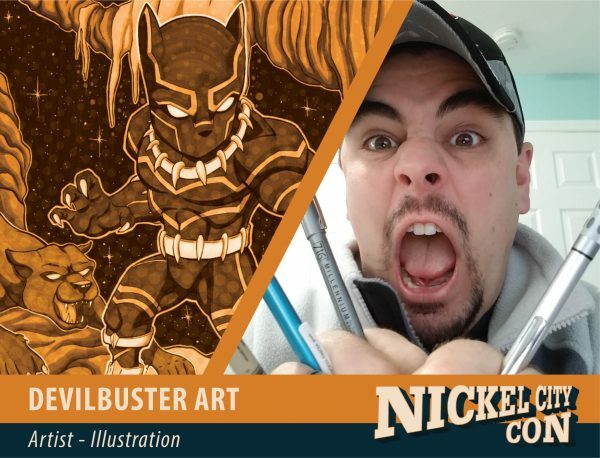 I have done work over the past couple of years on tshirts, posters, commissions, and most notably my work with Marvel and Upper Deck on their artist sketch cards. Over the past year though I have really developed my style and have found success with my childlike renditions of your favorite characters from movies and tv all the way up to and including comic books. My style and look is inspired by my 2 kids and their innocence and love for superheroes and cartoon characters. Over the years as we grow older, I have found that our childlike innocence, sense of fun, and lack of stress dissipates and my art is a great way to have fun and cope with the everyday stressors and events I endure in my primary career. I look forward to seeing you all at Nickel City this year and hope to have the opportunity to meet and talk with as many of you as I can!